You probably have a dream of running a full fledged eCommerce store, selling your products across the world. Whether you’re selling hand-crafted goods, supplements, clothing, or anything else in the world, the power of the internet allows you to reach the people who need your products the most. If you’re dead set on building a popular and profitable eCommerce store, then you need a software solution to support your business goals. BigCommerce and Shopify are two of the leading players in the eCommerce space. When you’re just getting started it can be difficult to determine which eCommerce platform will be the best for your needs. After all, you want to spend time building your store, not spending hours upon hours researching the best eCommerce option. Which is why we created this post. Below we highlight everything you need to know about Shopify and BigCommerce, and how you can make the best decision for your new online store. There are multiple paths you can take when building out your eCommerce empire. There are countless WordPress plugins and themes that can help you build an eCommerce platform, or give you a way to sell your products. Then, there are full-featured solutions like Shopify and BigCommerce. The route you choose depends upon your goals as a site owner. If you’re looking to build a popular blog, and sell products on the side, then a plugin might be a better fit. But, if your goal is to build out a fully featured eCommerce store, then choosing a full featured solution will probably be the best option for your needs. Software like Shopify and BigCommerce is designed to make selling products and scaling your business as easy as possible. Relying on Shopify or BigCommerce is the difference between building a house with a foundation and one without. A house with a foundation is that much more stable and will last over the long-run. If you’re set on selling products online then you’ll want the right kind of software behind your business. That being said, let’s jump into an analysis of the two biggest players in the eCommerce space, Shopify and BigCommerce. 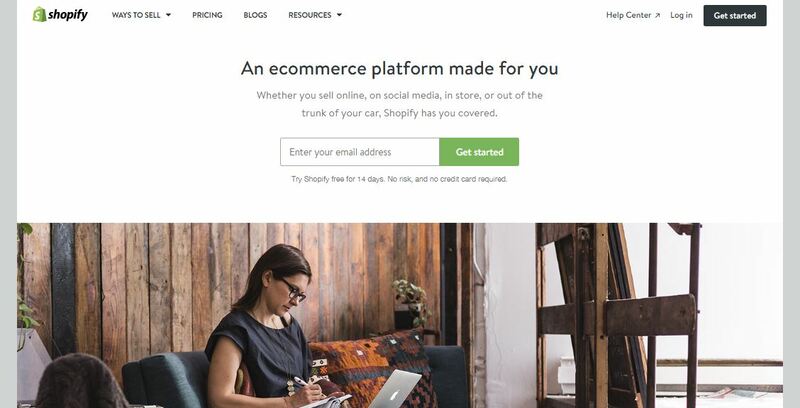 Shopify is one of the most popular eCommerce platforms out there today. It’s geared towards beginners and allows you to build a fully functional eCommerce store from scratch, even if you have no development skills. The flexibility and ease of use of Shopify makes it widely used by some large brands like, Camelback, Toyota, and Payless. For a full list of other brands that use their platform, then check out this list. Don’t worry if you’re a smaller brand, you won’t be alone in using this platform. They offer a ton of different templates you can utilize and customize to your liking for your store. They also have over 20 designs you can choose for free and over one hundred that you can pay for, if you have the initial budget. Plus, all of their templates are mobile responsive, so your site will look good no matter the screen size it’s viewed upon. If you know your way around HTML and CSS, then you can customize your theme even further, as you have full access to the code for your site. However, if the thought of looking at code overwhelms you, then no worries. They also offer an easy to use theme-editor that lets you customize every element of your theme to your liking. Shopify also offers a POS system that can be a true time saver and help to integrate your business with both the online and offline world. Their POS system lets you collect payments anywhere. Basically anything you’ll need to get started with your online storefront is included with your Shopify subscription. Designing how your eCommerce store actually looks and functions is the fun part. However, being able to easily manage your products, orders, and inventory is very important too. Having to navigate a complex or clunky system won’t be fun for anyone. Adding new products to Shopify is actually quite painless. If you’re used to the interface of WordPress to manage another blog or website, then you’ll be right at home. You can fully customize every product in your arsenal and change elements, like: product descriptions, product categories, images, shipping costs, inventory tracking, prices and coupons, shipping costs, price variants, and even manage gift cards. What’s the Cost of Shopify? For most business owners price will be a big determining factor in which software you end up using. Shopify has a few different basic pricing levels, along with transaction fees, depending if you use Shopify Payments, or not. If you have an existing website that utilizes WordPress, Squarespace, Joomla, Drupal, or a number of other systems, then you can utilize their Lite version, which is $9/moth, and lets you add eCommerce functionality to your existing website. When considering price it’s important to think in terms of value, over price per month alone. Sure, cutting costs in the short-term might work for a few months, but when it comes to growing an eCommerce store you’ll always want to be thinking long-term. Shopify also charges a transaction fee per item, depending upon which plan you’re using, it ranges from .5% to 2%. However, this fee will be waived if you use Shopify Payments to manage your payment processing. There is still a payment processing fee, even with Shopify Payments, but this is something that can’t be waived in the world of online payment processing. For a complete breakdown of their payment terms and fee structure, then check out this page. BigCommerce is another main player in the eCommerce space and enables you to build a full featured eCommerce store entirely from scratch. It’s stocked full of features and tools that can help you grow your online store no matter where you’re at on your eCommerce journey. BigCommerce can be useful for beginners. However, it’s probably most valuable if you already have an existing site that receives a ton of traffic, or are an established brand. BigCommerce is also known for having a stellar uptime, which means that your site is virtually guaranteed to never go offline during a crucial moment. According to BigCommerce sites that utilize their platform grow by an average of 28% per year, which is 2x the industry average. The dashboard and design of BigCommerce is very similar to the Shopify dashboard and lets you modify all information related to your products. BigCommerce also offers additional tools that lets you create blog posts and other pages to increase the amount of traffic your website receives. In comparison to Shopify, the theme selection offered from BigCommerce is a lot smaller. But, if you know your way around HTML and CSS, then you’ll be able to easily customize your theme to your liking. You may have to search around for a bit to find a theme that’ll be a match for your site, especially if you’re looking for a free design to customize, but BigCommerce did just add a slew of new theme updates so their theme selection is constantly expanding. However, even if you have no tech skills you can still customize the look of your theme with the built-in design editor. You’ll be able to customize things like your logo, image carousel, headers, home page menu, and more. When making changes in BigCommerce the platform does feel a bit heavier and not as intuitive, however, this is due to having increased customization features. If your store requires more advanced product customization features, then this will be a welcome addition for you. Like we alluded to above BigCommerce does have some additional software features that won’t be available for Shopify users. Some of these include things like: adding product reviews, basic email marketing integration, shipping quote estimation, and even the ability to generate gift certificates. BigCommerce also has their own app store, which allows you to extend the capabilities of your store even further. This is similar to the app store offered by Shopify, and you’ll be able to find the right plugin for your needs. Overall, BigCommerce is more stacked with features than Shopify. With Shopify you may have to pay for integrations for features that come included with BigCommerce. BigCommerce makes it incredibly easy to add new products and manage your inventory across your site. The user interface isn’t as streamlined as Shopify, but it does have a lot more customization options available. If you require a lot of customization options for each product you upload to your store, then most of these options will be useful. But, if you’re a beginner, or have very simple products, then all of these choices might get a little overwhelming. Inventory management is easy. Especially, if you’re looking to display items across your home page. All you have to do is select the star option on the ‘Products’ screen and your product will be featured. The interface of BigCommerce is a little less intuitive than Shopify, but it does provide you with more extensive product customization options. What’s the Cost of BigCommerce? BigCommerce has a similar price breakdown to Shopify, in their initial pricing. However, there are limits to how many products you can sell at each respective level. For the Standard payment option you can sell up to $50k per year. For the Plus option you can sell up to $125k per year. For the Pro payment option you can sell up to $1 million in products per year. However, BigCommerce doesn’t require any transaction fees, regardless of the payment processor you end up using. 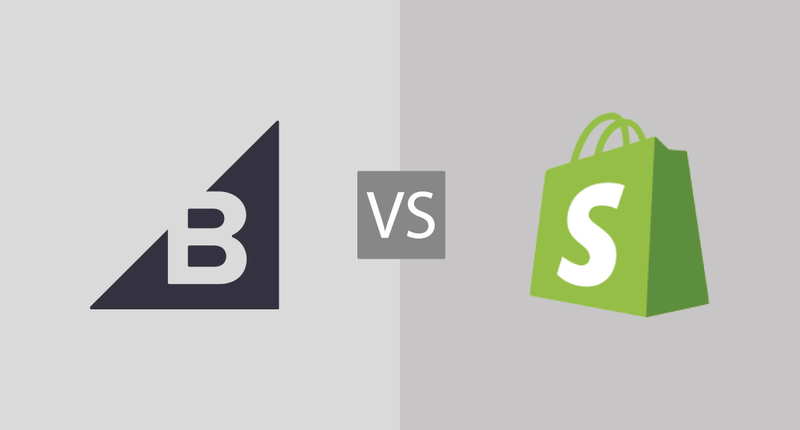 Overall, the pricing structure for BigCommerce and Shopify are quite similar. Beyond the basics we covered above we thought it would be useful to dive into a few other factors that might make or break your decision in the platform you end up choosing. Both platforms offer the ability to create unlimited product listings and near endless product and store options. Both offer the ability to follow up with customers who abandoned their shopping carts, which can be incredibly useful. Once you’re getting steady traffic and sales, then tiny tweaks in your conversion rates can mean huge differences in your profits. There is no clear-cut winner when it comes to shopping cart optimization, which is probably a good thing. However, Shopify does seem to make it easier to optimize your product listings for Google’s Product Listing Ad’s. These could be a nice source of additional revenue for your business, as advertising via these listings can be quite cheap. One important feature that a lot of eCommerce store customers are growing to expect is the ability to provide real-time shipping information and package updates and quotes. This feature is standard for any BigCommerce plan, but is only available on Shopify’s most expensive eCommerce plan. Of course, there is a work around the get the feature enabled on other Shopify plans, but this is nice to have right out of the box. Website speed and site performance are important not only for your user experience, but it even impacts your search rankings as well. Having a slow loading site is the best way to have users avoiding your site at all costs. Put simply, your site needs to load quickly and have a high uptime. Both platforms boast about having a 99% uptime, and having fast loading speeds. We’ve found that Shopify sites do tend to load a bit quicker on average. But, this could be due to how large the site is, and any onsite optimization they’ve done. Regardless of the platform you use it’s important to take optimization efforts into your own hands, and do things like image compression, and ensuring you’re not installing too many apps or plugins across your site. Customer service is an incredibly important part of doing business online. When something goes wrong with your store the last thing you want is to be left high and dry. However, one thing you can do is learn from the support experiences of others. Both have large and dedicated support teams. However, there have been a lot of complaints floating around about BigCommerce’s support team. Most of the complaints have to do with their request getting passed along to multiple departments, or support forum requests going unanswered. Of course, good moments and simple fixes exist as well. But, overall it seems that the Shopify support team is better equipped to handle their growing platform and user base. If you’re concerned about customer support one of the best methods is to try it for yourself. Submit a simple report request on each platform and see who is able to handle your request in the quickest and effective manner possible. Personally, it’s Shopify for me. Unfortunately, there is no way to recommend the best eCommerce platform for every site owner’s needs. The platform you choose will depend upon a variety of factors. Both platforms work to achieve the same end goal, have similar features, and pricing options. If the thought of having to mess with any code frightens you, then Shopify might be a better choice for your needs. Shopify is more easily customized through their internal editor and by installing any integrations with specific apps from their store. This lets you put more focus on your business, instead of spending too much time getting your hands dirty with customizing your site and codebase. BigCommerce does have a little more functionality right out of the box, but does require some coding know-how if you’re looking to truly customize your own storefront. BigCommerce does support a lot of app integrations from their app store, but most of the customizing will be done in your own codebase (in regards to site appearance). There’s nothing wrong between choosing one platform over the other. If you still can’t decide then we offer a few quick parting words that might sway you one direction or the other. If you’re a beginner who’s looking to build a storefront in the shortest amount of time, then Shopify will be a great choice for you. But, if you’re planning for long-term growth and know that you’ll need to create a lot of custom product features and descriptions, then BigCommerce might be better for your needs. Once again, you need to evaluate the above factors. Ask yourself: what key elements do I need from my store? Then build from there. We hope the build above will help you choose the right eCommerce solution for your needs. Looks like a sponsored post from Shopify.. Biased comparison without knowing the true feature sets and facts.. Absolutely not. This is not a sponsored post. I personally test and review all web builders and my opinion is that I think Shopify’s overall offering takes some beating. I’d be more than happy to publish you opinion in more detail should you wish to reply to this feed.